Make any event a regal occasion when you wear the Royal Velvet Medieval Gown. This medieval dress has long, elegant handkerchief sleeves and long skirt with inset panels of smooth satin in beautiful contrast with its lush velvet form. The round neckline is accented with a satin panel that points down in the front in a flattering V shape, and the sleeves are lined with that same satin fabric. Lacing at the back of the torso in matching cord ensures a flattering fit of this velvet Renaissance dress. 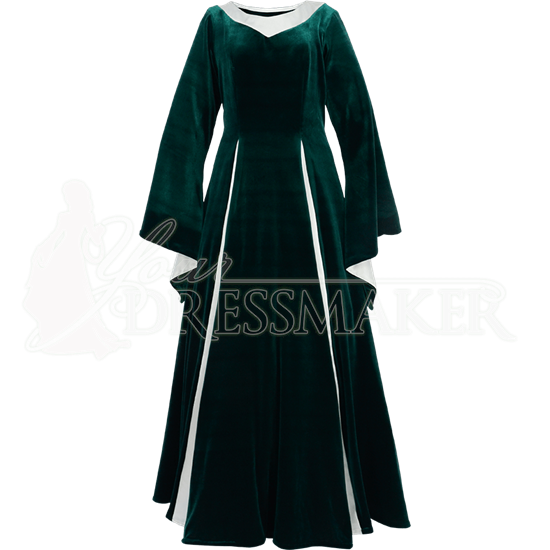 The Royal Velvet Medieval Gown comes in a range of sizes and in a variety of colors. For the satin accent, choose from white, gold, or silver. Perfect for queenly characters, princesses, nobles, and others who wish to dress in unmatched beauty, this royal maiden gown is great for Renaissance fairs, reenactments, performances, and even medieval weddings.